Curious about new case studies? Time for a refresher? Sign up for one of our Periowave webinars! Are you interested in learning about our new case studies and indications? Or are you looking for tips on patient selection and best practices? We currently offer special webinars to address your needs to successfully integrate Periowave into your dental office. Please contact Customer Service for more information and to set-up a webinar for your team! 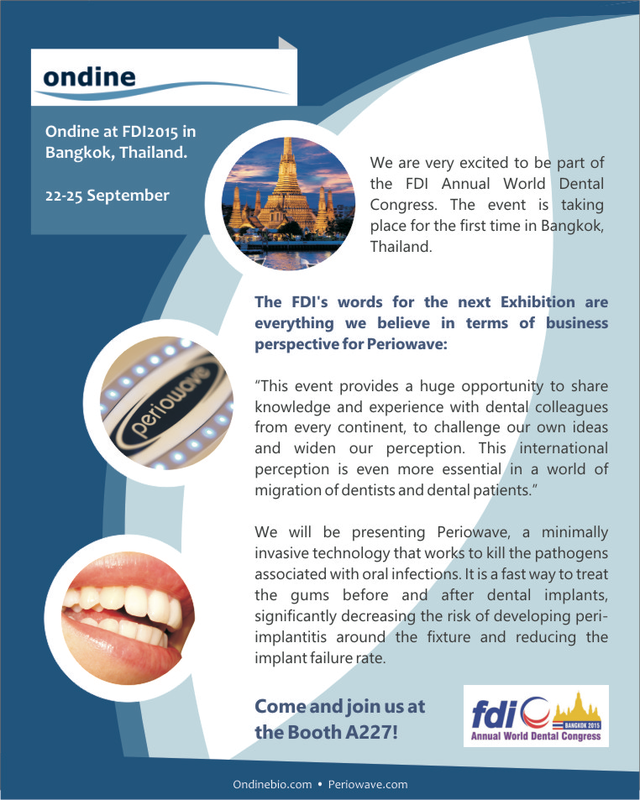 Ondine Biomedical is presenting Periowave at the FDI World Dental Congress as it is hosted for the first time in Bangkok, Thailand. Ondine Biomedical congratulates Dr. Marta Segarra Vidal for her recent Oral Communications of Research award at the SEPA conference (Spanish Society of Periodentists). This recognition relates to Dr. Vidal’s work with photodisinfection and Periowave at the University of Valencia, where this technology has been deployed for the past few years. Periowave Dental Technologies, Inc., announced that it has acquired an exclusive license for the disinfection and sterilization of tissues, wounds and lesions in the oral cavity from UCL Business PLC, the technology transfer company of University College London, London, UK. Professor Michael Wilson will be speaking at the Pacific Dental Conference on March 11th from 8:30am-11am in room 302, inside the Vancouver Convention Center. Jan. 31, 2011 – Kindness in Action announced that it will be returning to Peru this February in an effort to promote oral health to poverty stricken communities. Periowave Dental Technologies is thrilled to announce the arrival of the new HHL-1000 handheld laser. At the end of January, Dr. Veronique Benhamou took a team of 15 to northern Peru to provide much needed dental treatment to locals in need. Advanced Formulation has been shown to destroy 99.999968% of P. gingivalis biofilm in vitro when activated for only one minute.